The fix for this is hinted at in the docs of TinyMCE. 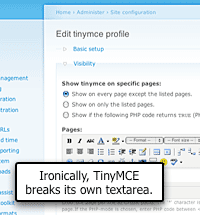 You can specify a list of named textareas for TinyMCE to ignore from inside the theme function, phptempate_tinymce_theme(). For each named <textarea>, you can unset the TinyMCE $init. Which is somewhat useful, but everytime you add a new module, you’ll find a new list of <textarea>s that get screwed up. And voila! TinyMCE will now only hook up with node bodies, block bodies and comments. // default, and allows only on the following textareas. I've used tinymce on only one project and don't plan to ever use it again. It has nasty habits like inserting silly <br type="_moz" /> tags. The only logic that theme_tinymce_theme() performs is “Force the 'simple' theme for some of the smaller textareas.” But my function only enables TinyMCE for 3 textareas, and none of them are in that list of “smaller textareas” so its totally unnecessary to call it. But if anyone is thinking of using the technique I outlined, they should, of course, review the theme_tinymce_theme() code in the tinymce.module file. Even usually don't use tinymce, this could be really nice trick.